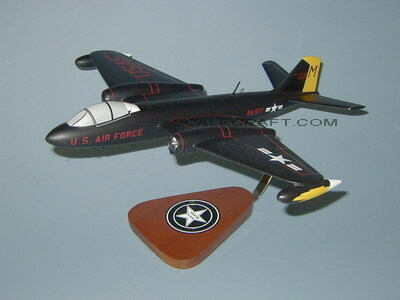 The Martin B-57 Canberra was a twin-engine jet bomber and reconnaissance aircraft which entered service in the 1950s. Originally based on the British English Electric Canberra, the US-built B-57 had evolved into several unique variants. Mahogany Wood. Wingspan 16 inches, Length 16 1/2 inches.